Children play on a broken swing set at Henry Horner Homes in 1993. On a humid Friday in August 1995, Henry Cisneros stood on a makeshift dais on a crumbling basketball court in the Henry Horner Homes on Chicago’s Near West Side. Mayor Richard M. Daley, Horner Local Advisory Council President Mamie Bone and other VIPs flanked Cisneros, who at the time was the U.S. secretary of Housing and Urban Development. They had come to witness the beginning of the end of the towering housing development, one of the first in the city to come down. Soon after, a 4-ton wrecking ball, attached to a crane nicknamed “Big Mama,” smashed into a 14-story brick high-rise at 2145 W. Lake St. Within weeks, two high-rises and three mid-rises were reduced to enough rubble to fill 3,800 dumpsters. Annette Hunt believes she was there that day, but she says she has blocked the events from her memory. She still seethes with anger when she talks about the men on the dais who had ignored the residents of Horner for years and then took credit for dismantling the housing development. She and the other residents had banded together. They formed the Horner Mothers Guild, which forced the Chicago Housing Authority’s hand in bringing down the towers. And even as the wrecking ball chipped away at the first building and some of the residents collected falling bricks as mementos, Hunt doubted that the politicians would honor their promise to improve the lives of residents, not just build better housing. Twenty years after Cisneros declared Horner a bellwether for the nation’s public housing, Hunt lives in a building with working elevators and clean, well-lit stairs. Violent crime in the neighborhood around Horner has been cut in half. The average income of Horner residents has increased. And the revamped development, which once was the exclusive domain of very low-income families, now includes middle-class residents and homeowners. But that wasn’t what Hunt and other longtime residents envisioned the day the first tower came down. What began as a mothers’ crusade to protect their children from gangs, rats and roaches evolved into something else. The mothers’ goals, and those of other residents, took a back seat to new hypotheses, favored by housing officials, about how to help poor people move up and then out of public housing. Creating mixed-income communities where public housing once stood was the product of the hypotheses. Today, local and national housing officials have embraced the idea of middle-class and poor people living together as an incentive for the latter to aspire to reach a higher-income rung. The idea is embodied in Chicago’s sweeping Plan for Transformation, which turned 15 this year. It’s unclear whether tearing down the Henry Horner towers and the following social experiment to house middle-class and public housing residents in the same space have worked — and, more importantly, for whom. The unemployment rate for black adults in and around the former Horner Homes is 29 percent, roughly the same as it was a decade ago. One-quarter of the 1,000 black households in the neighborhood earn less than $10,000 per year, while more than one-quarter of the almost 200 white households earn more than $125,000, according to the U.S. Census Bureau. Academics, lawyers, developers and even public housing activists argue that the mixed-income redevelopment of Horner was the most successful such endeavor in the city, because residents like Hunt had a seat at the table. But Hunt and other residents counter that turning public housing into mixed-income communities has always been for the benefit of the politicians and middle-class homeowners — not for them. A row of three-story red and yellow brick duplex apartments lines the north side of Washington Boulevard, across a two-block sea of parking lots from the United Center. At night, the LED Jumbotrons reflect in the apartments’ second-story bay windows, providing an endless loop of promotions: the Chicago Bulls matchup, Disney’s “Frozen” on Ice, the Chicago Blackhawks’ Twitter and Facebook accounts. These modern apartments are a glaring promotion of their own; they advertise just how different the development, now called Westhaven Park, is from what the Henry Horner Homes were. Alex Kotlowitz’s 1991 book “There Are No Children Here,” the heart-wrenching tale of two brothers living in one of the crumbling mid-rise buildings, etched the Horner of that era into the public consciousness. The process of turning Horner into Westhaven began the same year that the book was published. In June 1991, the vacancy rate at Horner reached a peak of nearly 50 percent. The Horner Mothers Guild sued the U.S. Department of Housing and Urban Development and the Chicago Housing Authority. The women claimed that the agencies were effectively demolishing public housing, in violation of federal law, by failing to repair and lease out the units. Hunt, who now works as a customer service monitor at the Horner management company, was on the board of the Mothers Guild. By 1991, she had been living at Horner for 21 years. She had four small children: a 10-year-old and a 4-year-old daughter and twin 7-year-old boys. She scrunches her face in disgust as she recalls how she and her kids had to sleep with cotton balls in their ears to keep roaches from crawling into them and laying eggs. In 1995, the Mothers Guild settled the details of a consent decree, a court-enforceable agreement with the CHA that required the CHA and developer to reach an agreement on each stage of development with a new body called the Horner Resident Committee. For example, in the first stage of redevelopment, residents at the Horner Annex, which sits on the southeast corner of the United Center, took a binding vote on whether they wanted to demolish and rebuild or renovate the buildings. They voted 57-14 in favor of renovation. But their power only went so far. In 1998, Congress repealed the “one-for-one” statute, a law that required that every public housing unit that is torn down be replaced. The original plan for Horner’s redevelopment called for rehabilitating, rather than demolishing, seven of the Horner mid-rise buildings. When polled in the fall of 1999, about one-third of Horner’s residents wanted to remain in a rehabbed mid-rise. But by the time a new developer submitted a plan to HUD for the subsequent stages of redevelopment in late 2002, those buildings were slated for demolition and to be replaced by mixed-income townhouses. Despite the consent decree and the legal representation, Horner residents still often felt powerless. Peter Levavi, senior vice president of Brinshore Development LLC, part of the team that has developed Westhaven Park, says they’ve tried to put residents’ concerns front and center. The CHA and residents clashed over whether to rehab or redevelop some units. The city’s goal was to turn public housing developments like Horner into mixed-income communities. The theory was that the main problem with public housing was the concentration of poverty. Proponents believed that placing public housing residents in lower-density buildings next to higher-income neighbors would strengthen the social fabric, the work ethic and political power of neighborhoods, which would lead to less crime and better living conditions. Hunt shakes her head as she sums up the theory. Public housing residents didn’t want mixed-income development, says Mary Pattillo, a professor of sociology and African-American Studies at Northwestern University. Most criticism of mixed-income redevelopment is based on its failure to satisfy that question. In 1995, Horner had 1,775 units, exclusively for public housing residents, though many of them were vacant. By the time redevelopment is complete, there will be 1,215 total housing units at Westhaven, only 622 of which are for public housing residents. Westhaven’s developer and the Mothers Guild’s lawyer say that this represents the highest percentage of public housing in all of the CHA’s mixed-income redevelopments. 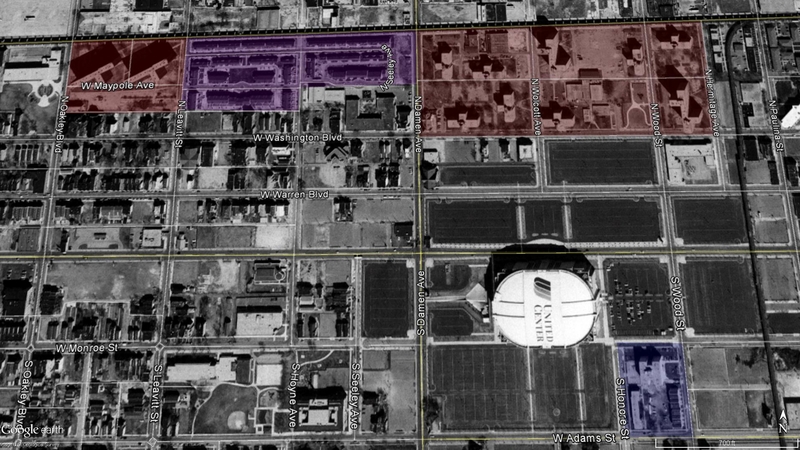 Use the slider below to view satellite images of the Henry Horner Homes in 1999, when the majority of the high-rises were still standing, and today. Jason Storbeck and his wife, Leisa, put down money on a three-bedroom, two-bathroom condo at Westhaven before the developer had even broken ground on the building. He says that he knew that the plan was to build a mixed-income community that maintained some housing for former Horner residents and that he saw potential in that plan. It was more affordable than the West Loop, he says, but just as close to his job downtown as a vice president of a company that valuates other companies. He bought his Westhaven condo for $351,500 in January 2007. But the neighborhood didn’t change as quickly as he expected. Though violent crime was down 53 percent in 2014 compared with 2001, there were more thefts in 2013 than in any year since 2004. Storbeck was under the impression that the Superblock, which is the name for the first 200 townhouses that were built at Westhaven in the late 1990s, would be redeveloped as mixed-income soon after he moved in. But it remains 100 percent public housing. He was frustrated by the noise late at night, by people hanging out on the corner, by theft and destruction of property that he feels diminishes the value of his condo. And he believes that the public housing residents were the problem. The public housing residents, on the other hand, feel targeted by the newcomers. Most of the crime is perpetrated by people who don’t live at Westhaven, says Charnae Harmon, who lives in the Superblock and is president of the Local Advisory Council, the organization that represents former Horner residents within the CHA. Public housing residents have been victims of break-ins and robberies, too. “If you have someone living next to you that’s paying little or no rent, that’s not bothering you at all, why cause trouble?” she says. Mark Joseph, a professor of social work at Case Western Reserve University and director of the National Initiative on Mixed-Income Communities, has found that tensions between public housing residents and homeowners at Westhaven are stoked by their limited interaction. The only neighborhood forums that draw both groups are bimonthly community policing meetings, where crime is the focus and public housing residents often become the targets. Early on, the Westhaven Park Condo Association created a phone tree, where owners could inform each other about issues — noise, loitering, property damage — so they could lodge multiple complaints with the Police Department, which Storbeck says was the only way to get the police to pay attention. The perception among homeowners was that most of the problems came from the public housing residents in the Superblock. Many homeowners got fed up and moved out. The housing market crashed shortly after Storbeck and most of his neighbors moved in, so selling wasn’t an option. But Storbeck, who is treasurer of the condo association, estimates that 40 percent of the owners are now renting their condos, many of them to college students. The neighborhood is a short commute from the University of Illinois at Chicago and Rush University Medical Center. The exodus of homeowners didn’t escape the notice of the former Horner residents. “I was just saddened, because of the way that we were singled out as public housing residents [as] the reason that they didn’t want to live next door to us,” Harmon says. Unlike some of his neighbors, Storbeck actually doubled down on his investment in Westhaven. In 2011 he purchased the condo directly below his in a short sale. It’s identical to his first condo, but he paid less than a third of the price. In explaining why, he returns to a familiar trope: There are too many low-income residents. His solution would be to scatter former Horner residents around the city. Cindy Blumenthal is a fast-talking woman who works out of a cramped office in the Major Adams Community Committee Neighborhood Club. Once the assistant director of resident services for CHA, she is now the program director for the Near West Side Community Development Corp., which runs job-training, after-school programs, counseling and case management services for former Horner residents. This year she has a CHA-funded budget of $1.2 million. The grand promise of mixed-income redevelopment — that it would “rebuild lives,” as Daley once put it — is Blumenthal’s daily challenge. According to new CHA data provided to The Chicago Reporter through an open-records request, public housing residents living in mixed-income housing at Westhaven earned $16,428, on average, in 2014, which is 25 percent more than public housing residents earned in 1999, adjusted for inflation. 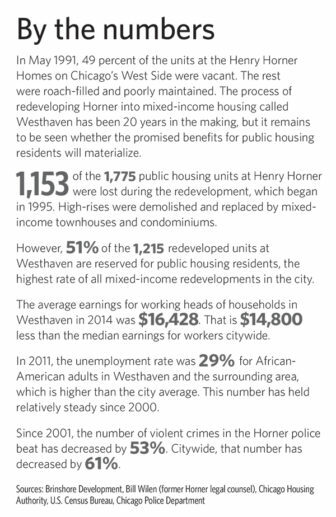 But it still puts Westhaven’s public housing residents well below the very-low-income cutoff, which is 50 percent of area median income, or $36,200 for a family of four. And that’s just for residents who are working. About 60 percent of work-eligible heads of household, which means those who are between the ages of 18 and 54 and are not receiving disability, Social Security or pension benefits, are employed. That doesn’t include people who are in school or a job-training program, and it is almost twice as high as it was for public housing residents in 1999. But census data show that about 2 in 5 African-Americans in the Westhaven neighborhood are out of the workforce entirely and the unemployment rate for African-Americans is higher than it is citywide. Blumenthal says the hardest part of her job is making residents aware of the opportunities that are available to them. For example, CHA will pay for any resident to attend a City College of Chicago. Redeveloping public housing as mixed-income communities was supposed to help inspire residents to do just that. Despite some signs of improving economic outcomes, it’s hard to say that Westhaven has been an unfettered success. What Levavi and others agree on, though, is that mixed-income housing was never going to be a panacea. The Plan for Transformation is just now reaching its adolescence, as are the children who grew up in it. Many observers expect that this generation stands to benefit most from the plan. It’s still too early to tell whether these children will be better off than their parents. Construction of Henry Horner Homes began in 1957. When they were first built, residents say the 11-building housing development was practically idyllic, with well-maintained buildings, green space and a brand new Boys Club (foreground, left). The first phase of development consisted of four 16-story high-rises and seven 7-story mid-rises. Some of the first residents move in. Residents board an elevator at Henry Horner Homes, a public housing development on the Near West Side, in 1967. By the early 1990s, the housing development had fallen into disrepair, with roaches, broken elevators and unlit stairwells. Horner was one of the first CHA properties to be redeveloped as mixed-income housing. In August 1995, the first high-rises were demolished and replaced by town houses. Charnae Harmon, who lives in the Superblock, waves to a neighbor as she heads to work. The Superblock is the name for the first 200 townhouses that were built at Westhaven in the late 1990s and it remains 100 percent public housing. Later phases of development include market-rate, affordable and public housing. One of the Westhaven Park apartment buildings, on Lake Street and Oakley Boulevard, sits in the same spot where the Horner Homes Extension once stood. One of the tenets of mixed-income development is that a passer-by shouldn’t be able to tell the difference between a market-rate unit and a public housing unit. Annette Hunt, who has lived in the Henry Horner Annex since 1970 and raised her four children there, says that creating mixed-income housing isn’t the cure-all that some officials make it out to be. The Henry Horner Annex was renovated in 1997. 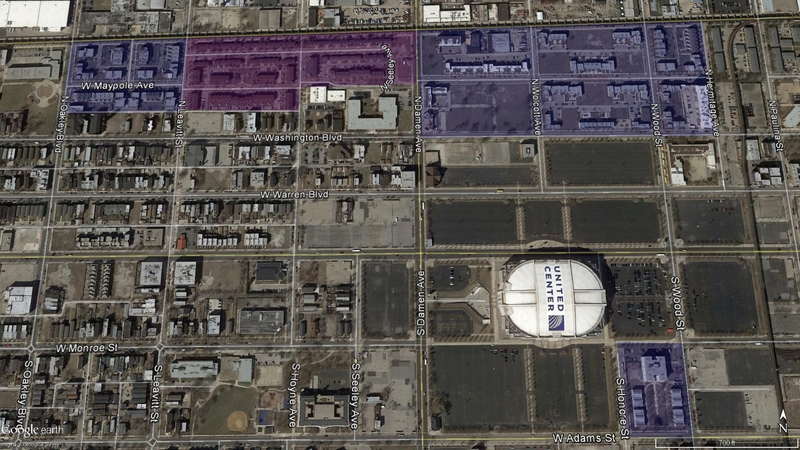 The three buildings that sit on the southeast corner of the United Center are the only original buildings left. On the corner of Madison Street and Western Avenue, a glistening new shopping center, anchored by a Pete’s Fresh Market grocery store, opened last year on what was once an empty lot. On a recent weekday evening, the parking lot was near capacity; the Magic Nails Spa was bustling with activity and several people waited in line at a Chase Bank ATM. Vacant lots still pock West Madison, which was once the commercial heart of the neighborhood before it was largely destroyed in the 1968 riots. But a few blocks east of the new grocery store, a 3,700-square-foot lot just sold for $750,000. It sits across from a PNC Bank branch and next to a half-block-long row of modern condos, whose floor-to-ceiling windows look out at another condo complex across the street. Both are independent of the Westhaven development. Everyone refers to this neighborhood as “up-and-coming,” a phrase that never would have been used to describe it 20 years ago. There’s no question that tearing down the high-rises and building mixed-income housing has played a large role in fueling the real estate speculation now playing out around Westhaven. The question that remains is whether this new development will benefit the former residents of Horner or will lead to gentrification and their eventual displacement. “That is probably the biggest risk and challenge of any development effort, whether it’s public housing or otherwise — to improve neighborhood quality of life without causing displacement of the people who live there,” says Carol Galante, director of the University of California at Berkeley’s Program on Housing and Urban Policy and a former assistant secretary at HUD. Annette Hunt, who has spent nearly half of her life fighting for the rights of low-income residents at Horner like herself — “the little people,” she calls them — is concerned about their future there. “In 10 years, I can slowly see low-income housing fading out completely over here,” she says. She sees that happening right now in the re-redevelopment of the Superblock, where the 200 townhouses built in the footprint of the first demolished high-rises are now set to be redeveloped again. This time, fewer than half of the units will be set aside for former Horner families. The process mirrors the cycle that resulted in Horner’s redevelopment in the first place: units began to deteriorate, CHA stopped leasing out units when they became vacant and crime was an excuse for turning public housing into mixed-income housing. The problem with mixed-income redevelopment is that it puts a premium on the contributions of middle-class residents to the community and discounts the contributions of low-income residents like Hunt, says Jamie Kalven, a journalist and activist who is a consultant to the Horner Residents Committee. One of the most significant consequences of mixed-income redevelopment at Horner and across the city has been the destruction of longstanding communities and the failure, thus far, to form cohesive mixed-income communities in their place. Twenty years after the towers on Lake Street were turned to rubble, residents are still fighting to be seen as an asset to the community, rather than a deficiency. Great piece. Thanks for writing it. Our community is trying to make a much larger redevelopment of federal public housing work. 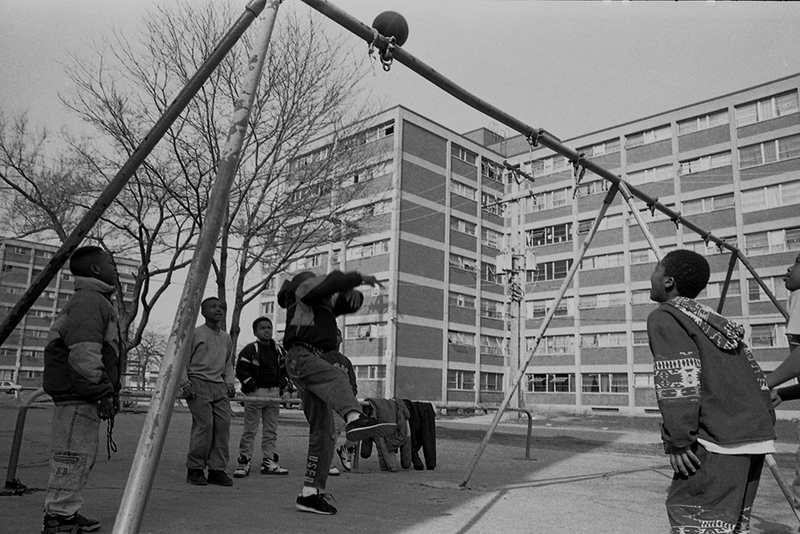 The CHA’s ABLA redevelopment, known as Roosevelt Square, is one of the largest, most poorly planned and incomplete redevelopments of federal public housing in the nation. At a cost of over $200 million, it has been nearly 20 years since the first HUD HOPE VI grant for ABLA was awarded to CHA in 1996, and yet the redevelopment is only 25% complete. It has been an unmitigated disaster by almost every objective metric. Institutional racism–either intentional or the resultant effect of ignorant planning of and participation in Roosevelt Square through funding, litigation, etc.– by BPI, CHA, MacArthur Foundation, City of Chicago, and CPS resulted in our only remaining neighborhood elementary school, John M. Smyth Elementary, being intentionally racially segregated as a poor black school, while 4 other neighborhood schools were closed over a period of 8 years and consolidated into Smyth. Smyth serves the entire socioeconomically diverse UIC community. This racial segregation of our school is, of course, completely contrary to the spirit and intent of HUD’s HOPE VI program and enabling federal legislation and curious because before Alex Polikoff walked into federal district court in 1966 to file Gautreaux et. al v. CHA, he had just won an education desegregation case against the Waukegan School District. Gautreaux also rests, in part, upon Brown v. Board of Ed. of Topeka Kansas, but perhaps all this was lost on everyone decades later when planning Roosevelt Square and racially segregating the only public elementary school serving our community. Alex Polikoff and BPI are the good guys, for the most part, although they are very detached from the ground game resulting from their actions. Our community has been working for years to clean up the mess their decisions have made in our community and to right the very listing ship of Roosevelt Square before it sinks. By far one of the most balanced takes on the mixed income development concept I’ve seen. Superbly written and researched article. Living in Uptown as a long-time activist attempting to protect our low-income housing stock, I am pessimistic about what will happen to the poorer citizens in the area formerly known as Henry Horner Homes. We in Uptown have seen what the rhetoric about “mixed income neighborhoods” leads toward… it is a one way street, and (with notable exceptions such as Peter Holsten) developers will not opt to create low-income housing. In addition, there’s the every-election-cycle abuse of the poor by politicians aware of the growing middle and upper classes and quite willing to conflate gang activity with poorer families’ presence in the community. Our current Alderman, James Cappleman, is one beneficiary of such reactionary politics. They did this in DC, almost all the residents were Black homeowners and former project residents. It too descended into chaos except in DC they had shootings. The homeowners lost their shirts. Best to keep the ghetto people away. Fully, aware of policies “C.H.A” and HUD whom, project Hope IV grants demolished high rises mania nation wide admittedly failure. Europe emulated these polices didn’t encourage citizens, purchase retain the poverty regarding new structures have neighborhoods change? Gangs and violence before generalizations where is “Rainbow Push” and Nation of Islam to deter urban blight historically racist policies only few. Allow housing grants low interest loans what is new segregation American what about LGBTQ where facing new. Gentrification what? Never discuss HUD doesn’t favor LGBTQ households respect citizens bigotry effecting everyone difference Chicago,Boston and NYC which retains last. Of ancient relics of housing: policies say,majority non- White political lower Whites gotten. Housing vouchers suburban which keep from majority due,segregation forgotten “LGBTQ” Illinois face racism jobs and housing presently. Need repeal ask LGBTQ alderman, “Deb Mell, James Cappleman and Emanuel” friends, of Ed Lee mayor of San Francisco and Scott Wiener, for hope to cope: with discrimination in (housing policies oppose Democratic marginalized) polices. Dismay of defeat urban impoverished, neighborhoods: London Breed President of Broad of Supervisors San Francisco oppose (fair housing continue) displace whom those non affluent gentrification effecting. All of us rentals increase Chicago,Long Beach,San Francisco and L.A due,speculators of profits driven by foreign investors why Chicago no. Longer city unity “gentrified policies destroying hope whom bought majority “T Bonds” bankers buying downtown for profits. Yes, bigotry going continue recommend we can’t use segregation challenge the charade of segregation to obtain justice! I lived there from the start and this and many articles ignore an important fact – the CHA cut all contributions for security (doorman) after a year or two leaving the residents with the problem created by the CHA. Tearing down HH didn’t magically make the area safe, but the CHA acted like it did. So those who had paid market rate for units got screwed as the city just didn’t live up to its end of the bargain.